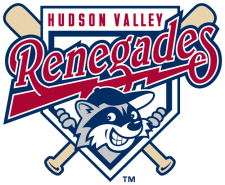 The Hudson Valley Renegades defeated the Staten Island Yankees 8-1 on Saturday night. The Renegades struck for five runs in the second inning and never looked back. The Renegades broke the scoreless tied in the second inning. Phillip Wunderlich singled to left to lead off the inning then advanced to second on a wild pitch. Burt Reynolds then struck out but reached base on a strike three passed ball, allowing Wunderlich to move to third. Reynolds then stole second to put two runners in scoring position. Elias Otero drove home both runs with a single to right. Alejandro Torres followed with a single to move Otero to second. Robby Price knocked home two runs with a double to right, then later scored on a double by Derek Dietrich to take a 5-0 lead. The Renegades added another run in the fifth inning. Dietrich led off the inning with a single to second then scored on an RBI double by Wunderlich to increase the lead to 6-0. Staten Island got their only run of the game in the sixth inning. Nick McCoy doubled to right then later scored on a single by Luis Parache for their only run on the night. Hudson Valley pushed across two more runs in the ninth. Price singled to left with one out to put a runner aboard. Price then stole second and scored on a double by Dietrich. Dietrich would later score on a double by Reynolds to give them the 8-1 margin of victory. Miguel Sierra earned the win, pitching 6 innings and allowing 1 run on 3 hits with 5 strikeouts and a walk. Nate Garcia pitched 2 no-hit innings with 2 strikeouts and a walk. Steve Hiscock pitched the final frame, allowing no hits with one strikeout. The Renegades wrap up the brief two game series with the Yankees on Sunday at Richmond County Bank Ballpark.